Guy Hoskie Bisbee Turquoise Graduated Row Bracelet size 8 1/2"
This is a bracelet that we commissioned Guy Hoskie to make for us. When we do this, we provide him with the stones and have him make the bracelets with hefty 12 gauge Sterling. This heavier sheet silver gives the bracelet a respectable heft which the fine stones merit and the thicker sheet silver allows for deeper stampwork which enhances the textural beauty of the cuff. This is one the largest bracelets we've ever had made. We know that the person who needs such a large size is out there and has been looking for such a fine piece for a long time, but never finds this size. 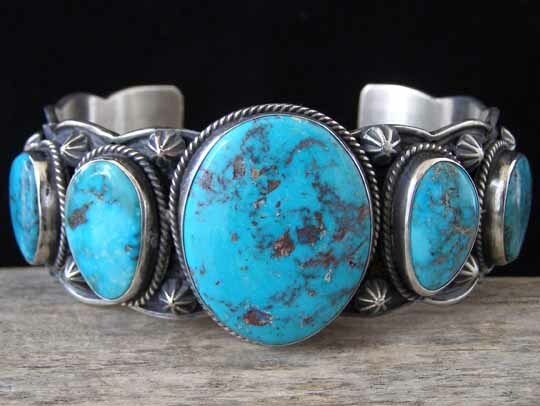 This bracelet is set with five premium stones of natural, untreated Bisbee turquoise from Arizona. These stones were cut by master lapidary Bruce Mead. We gave this set of stones to Guy Hoskie and specified the size and width of the cuff; leaving him to determine how best to flatter the group of stones through his use of deep, biting stampwork and decorative elements such as appliquées, twist wire and starred buttons. Stones: center 1 3/8" x 1 1/8"; left & right 7/8" x 9/16"; far left & far right 3/4" x 5/8"
Total inside circumference (including gap): 8 1/2"